It will take more than a few heart-opening postures to heal our troubled and divided world, but hey, they can’t hurt. If you believe we all contribute to the collective energy of the universe, then what we do as individuals–our own emotional energy–is a microcosm of the macrocosm. In other words, if we open our hearts more, then the universe opens with love a little more. The ripple effect of yogis around the world opening their hearts has got to make our planet a more loving and peaceful place. With racial and political division in the United States, division as Britain exits the European Union, and racial, cultural, religious, political and sexual divides pulling us apart all over the world, the only thing we may really have control over is our own hearts. Call me a naive yin yoga teacher, but I reckon we can all make a difference in collectively raising the vibration of the world with love and compassion. So here are a few heart openers to try – for yourself, and humankind. Place a bolster cushion across your mat and lie over the top of it, so that your thoracic spine at the bra strap line is lying over the bolster. Keep your legs long and allow your shoulders and neck to soften over the back of the bolster, bringing your arms out to the side in a crucifix position. If you have the shoulder range, the arms can be extended overhead. Use blocks to support the shoulder/arm opening if required. Hold the position for five to seven minutes, noticing the softening of the shoulder blades into the bolster, expansion of the rib cage, deeper breathing to fill the chest and lungs, and an opening in the armpits. The posture supports a strong opening of the heart chakra (Anahata) and an opening of the throat chakra (Vishudda). It "cracks open" the back of the heart between the shoulder blades, a deep place where we can store past pain and feel like we have the weight of the world on our shoulders. Envisage heartache flowing off your back like a waterfall and imagine breathing in love and kindness with your long and deep inhalation. Imagine exhaling love, compassion, and forgiveness and sighing out any pain. You are taking a leap of faith towards love in this posture, knowing that when you love you risk being hurt, but choosing to love anyway. Named for the heart chakra, this posture is a literal melting of the heart forward. It is an expression of openness and vulnerability–a bowing forward to the power of love. A strong backbend, it acts to squeeze or massage out stress pumped out by the adrenals at the base of the spine in the form of adrenaline, norepinephrine, and particularly cortisol, which we continue to produce when we stew on our problems. Kneel up with the knees at hip width distance apart. Slide the torso forward as you scoop out a concave in the back, bringing the chest and chin to the mat with arms outstretched in front of you and the sit bones (bottom) in the air. If required, place a bolster cushion under the forearms and allow the chin to rest on it to support softening into the posture. Hold the posture for approximately three to four minutes. 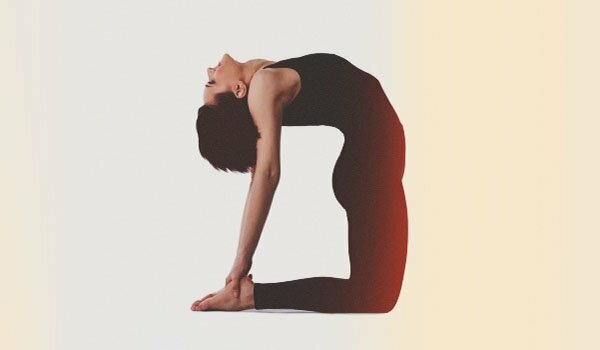 Camel posture (Ustrasana) is a deep back-bending asana that opens up all of the front chakra lines and can leave you feeling dizzy with the flood of energy it promotes. Support yourself for a longer yin hold in this posture by laying the bolster across the back of your calf muscles, then pressing forward with the hips, bending the back and reaching behind to place your hands on the bolster. Lift up into the bend from the base of the spine, squeeze your shoulder blades together, and thrust your heart forward. If you don’t have the range to comfortably reach the bolster, place blocks on top of it for each hand to reach down to. Allow the neck to fall back and look behind you. Hold for approximately two to three minutes and support your lower back as you exit the posture. Allow the flow of love with your breath and above all show yourself compassion. Our self love is the starting point for healing the world.